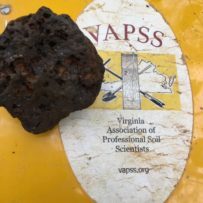 When most people think about Virginia, volcanoes do not immediately come to mind. However, many of us are living and working on top of what used to be one of the most volcanically active places in the world. 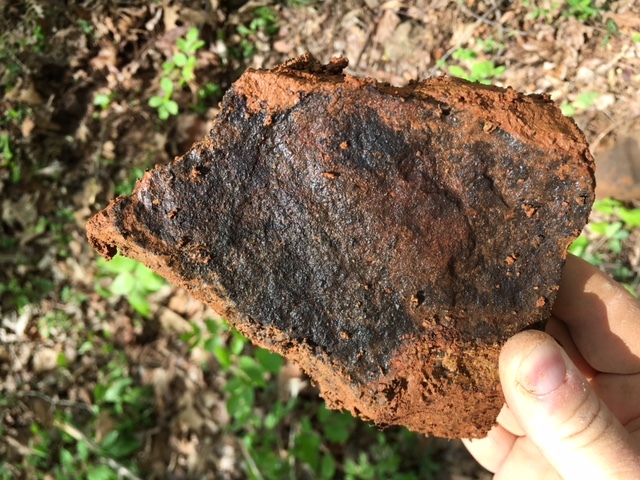 On a recent soil study in Fauquier County, we uncovered tangible evidence of our states tumultuous geologic history. Pictured above is a piece of lower Jurassic vesicular basalt. This odd looking rock was formed between 201 and 174 million years ago as the ancient supercontinent Pangaea, broke apart to form the Atlantic Ocean and the continents of Africa and North America. While the Earth’s continents appear to be static, they are actually continuously moving around on giant “islands” of the Earth’s crust called tectonic plates. These plates move at a rate of about one inch per year, driven by convection currents in the soft upper portion of the mantle. This movement results in a number of interactions between tectonic plates and can result the creation and destruction of mountains, ocean and continents as well as the formation of, volcanoes, earthquakes, tsunamis and more. When the supercontinent Pangea broke apart during the lower Jurassic period, lava from beneath the Earth’s crust rose to the surface and flooded onto the land forming the igneous rock basalt. The vesicles (cavities) that are apparent in the basalt that we uncovered resulted from the process of extrusion. As the magma rose to the surface of the Earth (extruded) the gases that were dissolved in the hot magma expanded as the pressure decreased. When the magma quickly cooled upon reaching the surface, the gas bubbles froze in place leaving behind a vesicular texture. 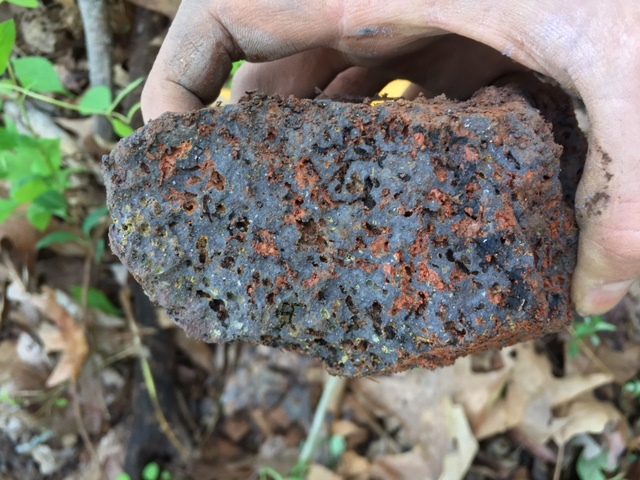 Not that we think soil is boring, but its little discoveries like this that help to keep us excited about going out day after day, playing in the dirt.